The job market is picking up, but recent reports have shown that it hasn’t been faring so well for the veterans of our country. 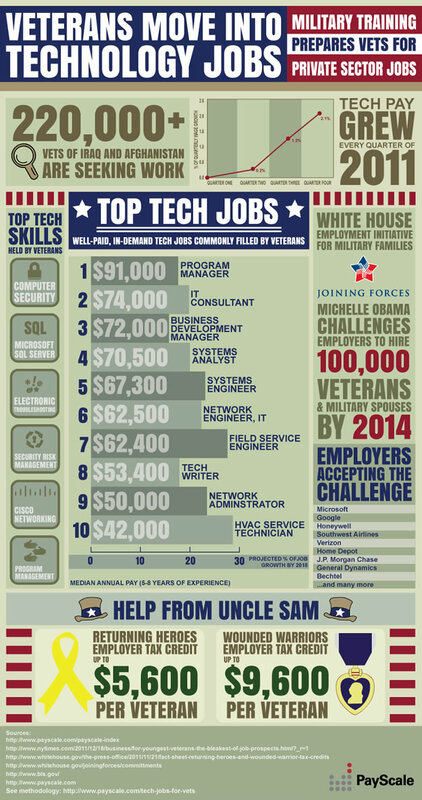 The following infographic from Visual.ly shows how veterans entering into the workforce are already well-trained to work in technology jobs. In fact, the top technology skills held by veterans include computer security, electronic troubleshooting, program management, security risk management and many more. These skills alone make veterans very marketable in the technology industry. Take a look at the top 10 technology positions filled by veterans. To hopefully aid in the hiring of these veterans, Michelle Obama has challenged employers to hire at least 100,000 veterans and military spouses by 2014. Hopefully with the tax incentives provided, more veterans can enter into the workforce and find jobs easily.